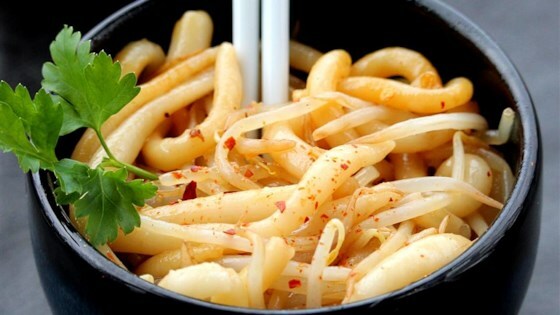 "Sichuan (Szechuan) cold noodle is one of the most famous Sichuan street foods. What I mean by street food is that you can get it almost anywhere in Sichuan--even a small food stand on the side of the street. It is actually simple to make, and the ingredients are easy to find. It is definitely a quick, easy meal, though you might want to watch out for the garlic. This noodle dish is better served right away. It does not taste as good if you leave it overnight and take it for lunch." Combine garlic and kosher salt together in a small bowl or mortar. Grind the garlic mixture with a wide spoon or pestle until paste is formed. Combine garlic paste, soy sauce, red chile oil, peppercorn oil, rice vinegar, and sesame oil in a small bowl; stir until sauce is well mixed. Fill a bowl with cold water. Bring a pot of water to a boil; stir in bean sprouts. Cook and stir until softened slightly, about 2 minutes; drain. Submerge bean sprouts in the cold water until cool. Transfer to a serving bowl. Bring water to a boil in a pot; stir in noodles. Cook and stir until noodles are softened, about 3 minutes; drain. Submerge noodles in the cold water until cool. Transfer noodles to a bowl; mix in vegetable oil. Place noodles on top of the bean sprouts. Pour sauce onto noodles; mix until thoroughly combined.